At about the time that David Cameron rose in the Commons to take Prime Ministers questions, thousands of real commoners gathered in Trafalgar Square to protest against an increase in student tuition fees and cuts to university funding. By the time PMQs had finished with very few questions answered, students, secondary school pupils, lecturers, teachers and parents were noisily but peacefully marching down Whitehall. By the time Michael Gove stood to deliver his white paper on education, the Metropolitan Police had blocked the planned route and began a process of “containment”. “Containment”, sometimes referred to as kettling, is a tactic of beautiful medieval simplicity worthy of a 7th century siege. A riotous mob is “contained” in a progressively decreasing area by a heavy police presence. The boiling anger is contained in the kettle and the steam is not allowed to escape to cause damage elsewhere. The theory is that the anarchists within will become calmer, tired, cold, hungry or might just need to go to the loo or simply go home. This, though, was not a riotous mob and was not allowed to go home. The school children, students and their elders had made their point and the vast majority wanted to disperse. However, they were not allowed to return along Whitehall to Trafalgar Square or along King Charles Street between the Treasury and the Foreign Office toward St James`s Park or down Richmond Terrace to Victoria Embankment. The lid was on the kettle and the heat turned up. Some of the more excitable youth decided to let of steam by trashing an abandoned police van left carelessly inside the sterile zone. There is a Met officer somewhere in deep trouble but at least he or she didn’t leave the keys in the ignition; heaven knows what carnage could have ensued. 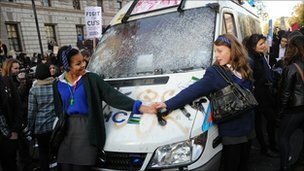 What is unlikely to be reported in the aftermath, is the fact that a group of uniformed schoolgirls surrounded the van and linked arms to protect it. Only when children and young people trying to leave the area were hit on the head with truncheons, pushed off walls back into the crowd and violently arrested did the wild-eyed tiny minority return to finish off the van. Media coverage of this demonstration was, and will undoubtedly be, disturbing. Before the unpleasantness and with little to report, the on line BBC news channel decided to remind us of the previous Millbank rumble when, by their own admission, the Met were unprepared. This time, both public service organisations were ready and both seemed to relish the thought of disorder. The BBC had a helicopter over Whitehall which gave us live, unedited images of the goings on. Safe in the studio, our news anchor spoke of a thin line of ordinary bobbies heroically holding back the protesters. As the live images showed riot police truncheons connecting with young skulls, she asked the reporter on the ground about police tactics. He said that the police were in control and he had not witnessed any use of force. Perhaps these journalists should watch the vision monitors. Clearly, vandalism and criminal damage is disgraceful and will only harm the reputations of the vast majority of those wishing to legitimately protest against injustice and a lack of fairness. The mindless looting of a police van will overshadow the real message and inform police tactics in the coming months. The press will become frenzied and politicians will sit back and tell us that they are protecting us from a descent into barbarism. Given the horror ahead, this is just the beginning. It is of interest that the Director of Communications for the Bishop and Diocese of Lichfield has stated on his blog that the protest was “just plain wrong” and suggests that the organisers should have called off the demonstration because “they knew full well” that it would end in violence. The Director admits that his opinion is formed by watching that bastion of impartiality and balanced news reporting Sky News. One wonders if he would admit to shouting at the television if, in a previous incarnation, Sky News had reported the overturning of the money lenders tables in the temple or, indeed, the persecution and torture of early Protestants. He suggests that disgruntled students and school children should engage business leaders and church groups, amongst others, in a public relations campaign. Sadly, anger is not that holy. Of more concern, and as retrograde as the white paper from Michael Gove, is the possibility of an actual police state. Reports are emerging that Twitter, at the request of the police, suppressed the #demo2010 hash tag that, by most accounts, was top of the trending topics list on the day of the protest. Even more alarming, as midnight approached, school children finally allowed to leave the kettle were being photographed by the Met and their identities checked and recorded. Some children have reported that they were charged at by riot police on horseback as they waited for the night bus home. The lesson that they learnt in Whitehall will be far more memorable than the lessons they missed at school. Six months into a coalition government and the police are kettling school children. What will happen when the police are made redundant? Top commentary again, sir. I would point out, however, that the Bish is notoriously right-wing and this is just the latest in a long line of pro-government Daily Express style statements that make his bible message seem a little leftist. Gove seems to be floundering to me – where have his free schools gone? It’s all looking a bit grim in Whitehall. Bring it on.